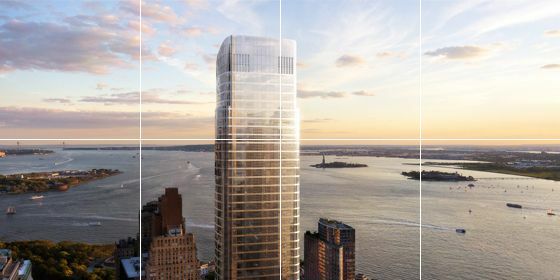 Designed by world-renowned architect Helmut Jahn, 50 West is a 64-story mixed use high-rise with retail and 191 luxury residential condominiums. G/BA staff commissioned the energy systems serving the 505,645-square-foot tower. 50 West is a 64-story mixed use high-rise with retail and 191 luxury residential condominiums. G/BA commissioned the energy systems serving the 505,645-square-foot tower. G/BA commissioned the mechanical, plumbing, electrical and fire protection systems, including boilers, air-handling units, cooling towers, plate and frame heat exchangers, water source heat pumps, supply and exhaust fans, domestic hot water heaters, and lighting controls, as well as the building automation system for the mechanical equipment. Recommend unit heaters for temperature control at stairwell roof entrance. Consider VFD control for new mechanical equipment. Provide access panel to allow access to isolation valves above the ceiling. Duct connection to riser is not an approved breakaway connection. Access door for fire damper not installed. Sanitary piping obstructing diffuser installation.